Say you are 5 feet 10 inches tall, weigh 250 pounds, and are applying for an administrative job at a hospital. If it happens to be with the Citizens Medical Center in Victoria, Texas, then don't bother applying -- you are too heavy for their liking. The southeastern Texas hospital has adopted an unusual policy in which it will not hire anyone with a body mass index over 35, or 230 pounds for anyone 5 feet 8 inches; 260 pounds for anyone 6 feet. In an interview with The Texas Tribune, which first reported on the BMI-based policy, CMC's chief executive, David Brown, defended the practice, saying the hospital had a responsibility to cater to its patients' preferences. "The majority of our patients are over 65, and they have expectations that cannot be ignored in terms of personal appearance," said Brown. "We have the ability as an employer to characterize our process and to have a policy that says what's best for our business and for our patients." Ironically, soon after the interview was published, a new study was published arguing that BMI is an insufficient measure of body weight. 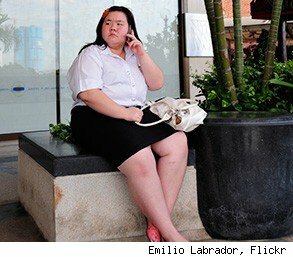 Still, most experts agree that obese and overweight Americans -- slightly more than two out of three adults fall into that group -- have few legal protections when it comes to workplace discrimination. Overweight Americans are only protected from discrimination if their weight is registered as a formal disability under the 1990 Americans With Disabilities Act. Although the Texas Hospital Association expressed concern about Citizen Medical Center's policy ("There is an indication that not hiring someone due to obesity might be successfully challenged in court," a spokesman told the Tribune), the fact is, it has been tough to win a discrimination case on the basis of weight. "Most employers would not admit [hiring someone because they are skinny] and would say they are more productive or whatever," Jennifer Pomeranz, the director of Legal Initiatives at the Rudd Center for Food Policy and Obesity at Yale, said in an email to AOL Jobs. "But if they were sued for not promoting or hiring someone based on their weight, generally the plaintiff does not have a case outside of Michigan." Yet a majority of Americans thinks they should. According to a survey of 1,000 respondents conducted two years ago by the Rudd Center, 65 percent of men and 81 percent of women support a law that would make it illegal to fire, refuse to hire, or deny a promotion or raise to a qualified person based on weight. Brown, of CMC, is also currently involved in another discrimination case over a memo he wrote in 2007, in which he expressed his "sense of disgust" over the rise of "Middle-Eastern-born" doctors at CMC.